To be honest, slow feeders for cats are near the top of my list of pet peeves. Cats who free feed a species appropriate diet -- wet food, not kibble -- don't need slow feeders. Since they never feel like they're starving, they eat slowly on their own. It's the cats who are forced to eat on a human schedule, not their own, who are likely to "scarf and barf." 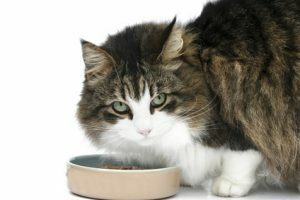 Cats who eat dry food that contains mostly grain are likely to eat too fast and then throw up, too, because they almost always feel hungry. Weight-loss foods also leave cats feeling hungry and cause cats to gulp down their meals the second they're served. That said, I suppose there are some good reasons for using slow feeders for cats. If your cat needs several small meals a day, a slow feeder could come in handy. Slow feeders for cats also have some entertainment value, if the cats can figure out how to use them. But if you're using a slow feeder so your cats can have fun "working" for their food, leave some wet or dry food out for them in regular bowls, too, so they know where to find a quick meal if they feel like they need one. Something to keep in mind is that cats are opportunistic feeders. Outside, they'll choose the most convenient food source they can find. That's why you find feral cats hanging around Dumpsters and restaurant kitchens. Snagging someone's leftover burger is a lot more convenient than catching a mouse! I've been watching pet sitting cats deal with slow feeders for years, and these are the slow feeders for cats they seem to like best and two we like least. Clicking on the links will take you to Amazon. Okay, so this isn't exactly a slow feeder for cats. But the Cat Mate C20 is the perfect solution if you want your cat to have several small meals a day. This feeder is easy to operate and is more reliable than other brands you'll find in the pet supply stores. Be sure to buy a second ice pack! I love this feeder because it comes close to mimicking the way cats eat outside. The only drawback is that you can't use it for wet food. The plastic mice are covered with tactile fabric, so they feel almost real. Dry food falls out as your cat swats the mice around. Of all the treat balls on the market, cats seem to like the Egg Cersizer treat ball best. The egg shape makes the ball roll in unpredictable ways, and that's more fun for the cat. The ball holds about one cup of dry food or treats. There are three holes. and you can adjust the size of the openings, depending on the size of the pieces of food and how hard you want your cat to work for a meal. I bought the popular Catit Senses Food Tree for my cats because it looked like fun, but they couldn't figure out how to work it. Although I demonstrated several times, they never got it. We finally gave it to a neighbor. In theory, this seems like a good idea. But in reality, cats are willing to work for food that runs through the grass, makes squeaky noises and smells like food. For many cats, cereal encased in plastic is really not worth the effort. This isn't a slow feeder. But SureFeed Microchip Pet Feeder is another kind of mealtime torture for cats. It sounds like a great idea if you live with cats who are on different diets, or if one cat eats all his food in one sitting, while another prefers to graze. The closed dish recognizes a cat's microchip and opens when the cat approaches. Simple enough. But let's think like a cat. Imagine how it must feel to see a full bowl of food through the clear plastic top and not be able to get to it. And watching a big cat try to squeeze under that plastic arch is actually painful. We don't, and won't, do prescription food at our house, so we'll never need a feeder like this. But to help out people and cats who do, the design really could use some tweaking.